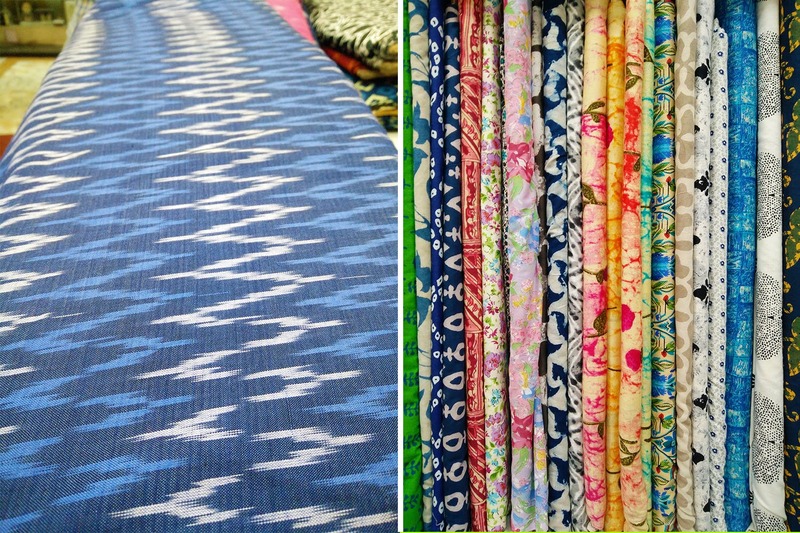 Ramgir Textorium is a nice little textile shop in Wonderland, on MG Road. We happened across them by accident, and were really impressed with their selection of materials, clothing, and prints. We found (among other things) soft cotton kurtas, a cute little traditional-style sleeveless jacket, and flowy palazzo pants in traditional patterns. Their clothing is cool and lightweight - ideal for the summer season, or to layer upon in cooler months. Each piece brings a unique sense of style to any ensemble you choose to pair it with - and would make great additions to your wardrobe. We particularly liked the variety of Ikkat material (starting from INR 250/metre) they had for sale - which you can buy per-metre and then have stitched into the outfit of your choice. Some materials are hand-block printed or made by skilled artisans from across the country, and some are machine-printed - but they're really lovely in quality. There isn't a designated 'trial room' - but they have a small loft-like space where you can try on something if you wish. We wish they had ready-to-wear cotton dresses in different sizes - but seeing as it's a small shop, not having this is understandable. You can commission customised Indian/Western clothing via their in-house tailor too, at very reasonable rates.